What a busy weekend we had last weekend! And what zero pictures I took of it all. Luckily others captured my child while taking pics of their own. Saturday Zach and Alex met their friends Scott and Tyler at a “members only” event at the zoo at 8am. (Thanks to my parents we are members) Alex actually set the alarm to get up which NEVER happens on the weekends. We like that baby to sleep as long as possible. They were gone for 2 hours. Apparently they hit McDonalds for pancakes first then the zoo. 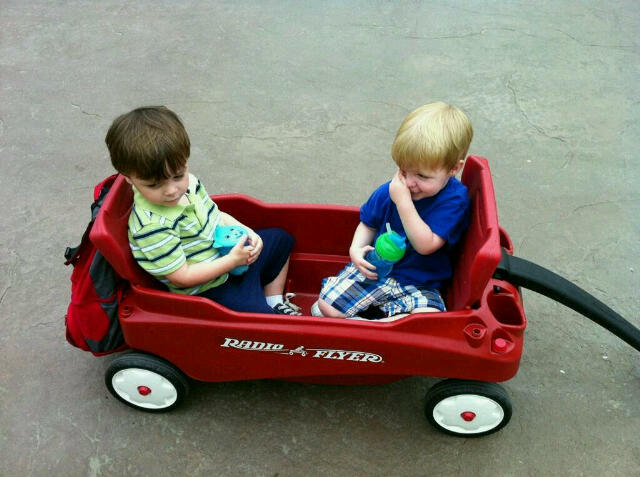 Tyler arrived with his red wagon which Zach quickly decided he wanted to ride in as well, leaving Scott to pull both boys while Alex pushed an empty stroller. Naturally. Mini-Scott and Mini-Alex pictured thanks to Scott. After Zach napped played in his bed for an hour he and I went to Caroline Hull’s first birthday party – complete with bounce house. That little boy was soooo sweaty. Besides the birthday girl he was the littlest person there. Luckily there were super sweet big girls in the bounce house so they didn’t get too out of control with a little boy flopping about inside. Here he is “helping” the birthday girl play in her water table. He and her cousin were filling the tub with ice water. Sweet baby girl was just laughing and splashing. Sunday we drove to Magnolia to visit my freshman year roommate Jessie and her family, which includes this rolly-polly delight, Olivia. The entire way out there Zach said “I go Wivia’s house”. He was super sweet with her and she was very sweet to share her toys with him. I was so excited to see Olivia after stalking her on Facebook. It was surreal hang out with Jessie and to see our babies playing together. The last time we really hung out we were 19 and motherhood was the furthest thing from our minds!